Using your design’s input voltage, load size, ambient temperature, etc., the calculator will help you design a thermally robust and reliable system. 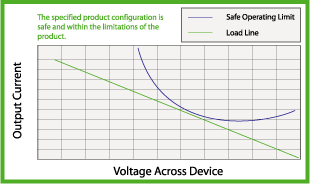 These tools will allow you to draw the SOA curve for a Wavelength Electronics product and, optionally, to also draw a load line for your specific application to easily design your application to fall within the safe operating area. 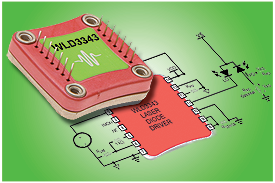 For a product that combines both laser diode driver and temperature controller, use both. Download the Configuration Calculator for the WTCP5V5A Evaluation Board. This easy-to-use component selection calculator simplifies system design and configuration. 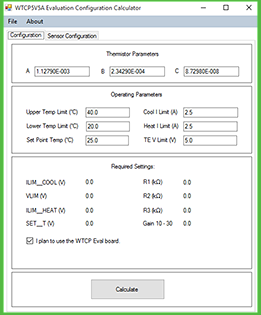 Simply enter your sensor parameters and the operating conditions for your application and the calculator will determine the Evaluation Board settings to achieve optimal performance.